My current 150 gallon-per-day RO/DI setup with two RO membranes. After tiring of watching so much waste-water go down the drain with my old RO/DI setup, I decided to install a second RO membrane to increase it's efficiency. 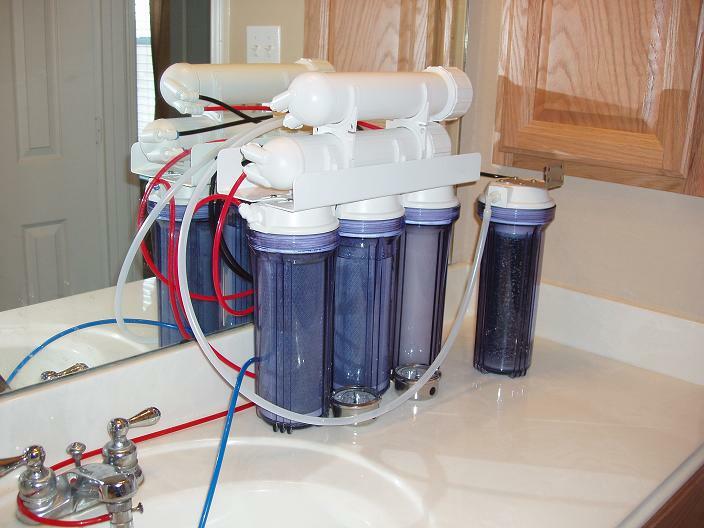 As you may know, most RO membranes produce waste-water in a 3:1 ratio to filtered water. This ratio only worsens over time as your sediment and carbon filters begin to clog and the pressure of the water reaching the membrane begins to drop. I had been thinking about adding a second RO membrane in-line after the first for quite some time. I saw this first at a local fish store that had actually piggy-backed three RO membranes. I never found out what kind of waste-water ratio they were getting, but the idea seemed intriguing. Most vendors claim that adding an additional RO membrane can cut waste-water in half as long as the tap water pressure is sufficient. The benefit seems great, but I couldn't find many individuals who had personally done it. 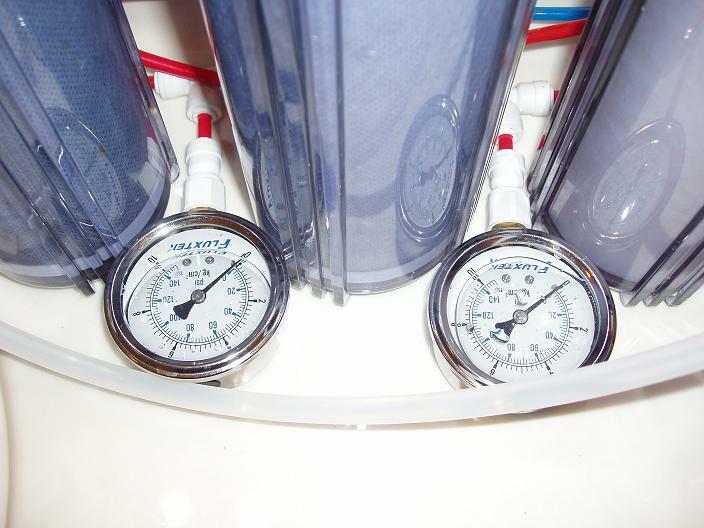 The left pressure gauge measures tap pressure, and the right measures pressure reaching the first membrane. I found that my tap pressure was only 60 PSI and only 58 PSI was reaching the RO membrane. That is to say, brand new sediment and carbon filters were dropping the pressure by 2 PSI. Although not quite 65 PSI, I decided I was close enough and purchased an additional membrane upgrade kit from www.bulkreefsupply.com. I went ahead and purchased a replacement for my current RO membrane as well, as it was reaching the three year mark. The logic behind the installation is simple enough but I found that a lot of pressure was needed to open my RO canister and pull out the old RO membrane. That is until I realized that heavy pliers were required, as described in this Melev's Reef article. The two membrane setup has proven a success for me. Currently, with relatively new sediment and carbon filters, I am observing a nearly 1:1 waste-water ratio. 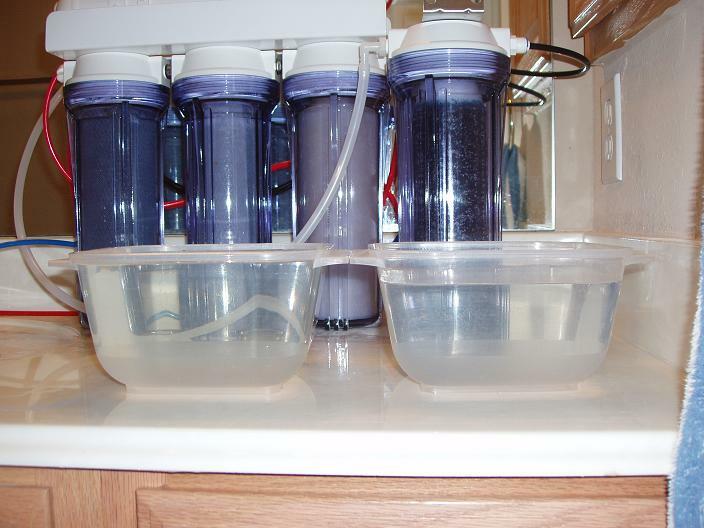 In this picture below, the container on the left has been filled with waste-water and the container on the right with filtered water. My nearly 1:1 waste-water to filtered water ratio. One thing I have noticed is that my effective rejection rate has been slightly reduced, which could exhaust the DI filter faster. However, I think the difference is basically negligible. Previously, my single RO membrane was taking in tap water at 179 TDS and producing water at 6 TDS (a 97% rejection rate). Currently, my two RO filters are together taking in water at 179 TDS and producing water at 11 TDS (a 94% rejection rate). Interestingly, my waste water is at a whopping 315 TDS. I don't have any measurements on the waste-water from my single membrane setup, but I'm sure that they were not this high. I really wasn't looking for an increased rate of water production but this new setup also affords me that. Whereas it used to take me 1 hour 20 minutes to produce 5 gallons of filtered water, it now takes approximately 50 minutes. Keep in mind that I inadvertantly replaced my old 100 GPD RO membrane with two 75 GPD membranes, so I was not expecting time to he halved.